Offshore and subsea construction company Hydra said it has entered into the saturation diving market in anticipation of an offshore oil and gas sector rebound. 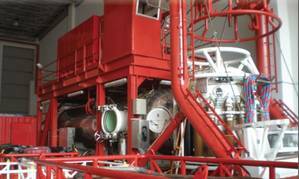 Trevor Davis, president and CEO of the Texas-based company, said Hydra has converted its flagship vessel Subsea Responder and acquired a modular 200msw/12-man saturation diving system to prepare for new projects as the oil and gas industry experiences an upturn. "The oil and gas industry is showing signs of a bounce back [after] reaching a five-year low," Davis said. "During that time, not all companies servicing the industry survived, which has left a need in the marketplace we're eager to fill." For, Hydra which was founded in 2010 as a provider of offshore and subsea construction services, adding saturation diving capabilities to its full-suite of services was the strategic next step, said Brent Sappington, Hydra project manager. "The decision to convert the Subsea Responder was easy," Sappington said. "As an inspection, maintenance and repair vessel, she already had existing equipment and 60-ton active heave compensated crane that made the alteration ideal." Newly installed on the vessel, the SAT-14 is a 12-man saturated diving system that allows longer duration in-water working time and greater working depths than are achievable using surface diving techniques. The compact system consists of dive and saturation control, Divex diver's hot water unit, Divex diver gas reclaim, Divex ECU, Divex potable water unit, nine-man deck decompression chamber, 12-man hyperbaric rescue chamber and a three-man diving bell. The dive system was installed this month at Consolidated Ship Repair in Port Arthur, Texas. "Our company is excited about the prospect of being part of the oil and gas industry's rebound," Davis said. "We're hoping to meet the needs of this new market with an efficient vessel and well-trained team."